Downing Street said it had established “an Alternative Arrangements Working Group” to mull the backstop issue starting today. THERESA MAY’S GOVERNMENT will discuss alternative arrangements to the Irish backstop with a working group including Eurosceptic MPs, as three days of talks begin today. Deputy chairman of the Eurosceptic group, Steve Baker MP, tweeted on Sunday to warn the May that there is “trouble ahead”. Leave-backing MPs voted to support alternative arrangements in NI but with grave misgivings about the whole agreement. Now the PM co-opts us into accepting everything but the backstop and, on the backstop, accepting a codicil. The group is expected to hold regular meetings with Brexit Secretary Stephen Barclay along with other government officials. The EU insists that the current deal “remains the best and only way to ensure an orderly withdrawal”, and German Foreign Minister Heiko Maas said Sunday that “if the British want to avoid a disorderly Brexit, our offer is on the table”. But with the clock running down until the 29 March exit date the risks of a no-deal Brexit for both Britain and the bloc are coming into sharp focus. Car giant Nissan announced Sunday it was cancelling plans to build its X-Trail SUV at its plant in northeast England, saying that “the UK’s future relationship with the EU is not helping”. 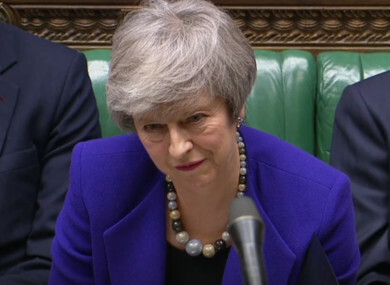 May said opposition leader Jeremy Corbyn “also believes the potential indefinite nature of the backstop is an issue”, and that the EU has “already accepted the principle of ‘alternative arrangements’ superseding the backstop should it ever be required”. The backstop would kick in if Britain and the EU have not agreed a trade deal on their future relationship after a limited transition period of up to two years. I’m determined to deliver Brexit, and determined to deliver on time – on 29 March 2019. May has promised MPs that she will bring any revised deal back to be voted on by MPs on 13 February. Warnings of the consequences of a no-deal Brexit intensified last week as several multinational firms, including Airbus and Ford, said jobs could suffer with an unfavourable negotiating outcome. Nissan dealt another blow on Sunday by announcing it was shifting future investment away from its largest European plant in Sunderland, northeast England, which employs 7,000 people. The car giant announced in 2016 that it planned to build its X-Trail model in Sunderland, but will now assemble it instead at Nissan’s global production hub in Kyushu, Japan. Several rebellious centrist Labour MPs, who want a soft Brexit or to stay in the EU, are mulling forming a new party, according to Sunday’s Observer. They are disillusioned with the ambiguous stance taken by leftist leader Jeremy Corbyn, who has been a long-term eurosceptic but said he voted to Remain in 2016. Email “May's cabinet to discuss alternative arrangements to backstop with Eurosceptic MPs”. Feedback on “May's cabinet to discuss alternative arrangements to backstop with Eurosceptic MPs”.